I even created a hand drawn (or more accurately 'mouse drawn') animated version which you can see at the beginning of The Cage video below. On the right is a closer look at the T-Shirt version (slightly distorted due to the T-Shirt stretching). If memory serves me correctly I think we had a screen with the stencil professionally applied then myself and my sister created a bit of a production line whilst I silk screened all the shirts we printed. This was an earlier idea for a logo that was used prior to the park being opened. I think 'The Cage' lettering was added later, after the park was named (it was called 'The Cage' because it was located on a disused tennis court with high fencing all the way around). Those of you familiar with my animation and video blog may recognise the artwork below which is from the same period. 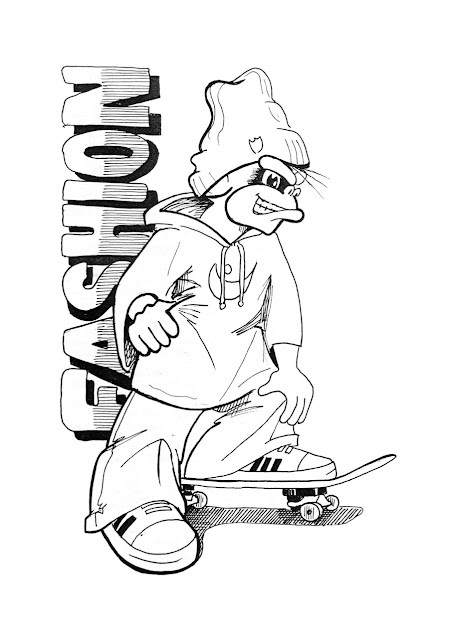 The character is the monster from the logo decked out in skateboarding gear. This particular image appeared in one of The Cage's Newsletters alongside an article I wrote commenting on skateboarding fashions of the day. What's interesting (to me at least) about the image above is that, through illustrating the newsletter I learnt a lot about the effect of using different line thicknesses in inking my drawings. How a thicker line could make parts of the drawing stand out more than others, creating a kind of depth to the image. I've still got my T Shirt hanging in my wardrobe. Shame it had to pack up.